When it comes to well designed luxury accessories, Apple’s iPhone have all the fun. Samsung mobile phone users while steadily increasing often find their accessories choices very limited. Thank goodness for Montblanc to tap into this neglected market and now they are offering sophisticated accessories to compliment the new Samsung Galaxy Note 4. Imagine using a Montblanc pen as your S-pen? That is truly the ultimate in combining luxury and style with technology. Montblanc is offering Samsung Galaxy Note 4 users a slice of their heritage and craftsmanship with their first ever, e-Starwalker pens. Cleverly designed for an interchangeable E-refill and analog ink refill, the new e-Starwalker pen (USD525) functions both for paper and screen. This is what I call keeping up with the times, and Montblanc shows great foresight to infuse their accessories with this edge. For existing Starwalker pen owners, fret not... you can just purchase the e-Refill (USD155) which is sold seperately and you can also work your Samsung Galaxy Note 4 with luxury finesse! As an alternative to the more pricey e-Starwalker pens, the Pix Pen comes at a lower price tag (USD350) but also feature an e-refill as well as black and blue ink. Further to the pen accessories, Montblanc will also ensure your new Samsung Galaxy Note 4 be clad in a beautifully crafted leather cover... with options for the Meisterstück Soft Grain Cover (USD245) or the high performance Montblanc Extreme Leather Cover (USD245). Both of these covers feature a digital ID chip that when attached to the Galaxy Note 4, provides users access to exclusive downloadable Montblanc digital content. These add-ons include a Montblanc version of S Note featuring unique pen settings, cover and template, as well as a 3D effect ink home screen wallpaper and unlock effect. No more excuse for Samsung phone users to settle for ill designed accessories now. Montblanc’s new Samsung phone accessories is the way to go! 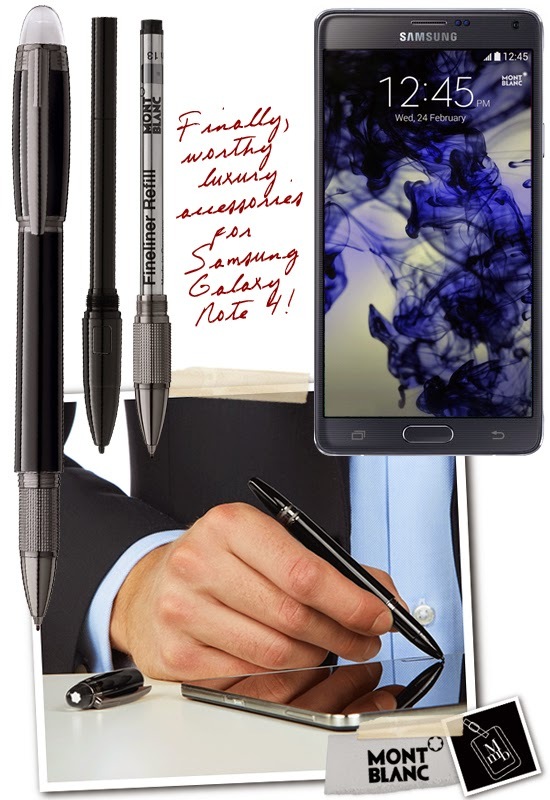 The Samsung and Montblanc collection will be available at Montblanc stores beginning in October. For further information, visit www.montblanc.com. 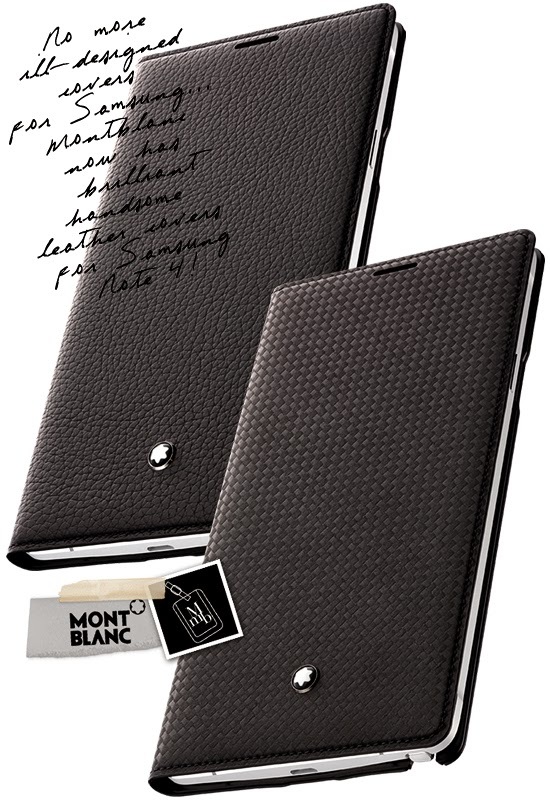 Click here for more pics of Montblanc Samsung Galaxy Note 4 Accessories on my facebook fanpage. 'LIKE' my fanpage if you enjoy reading this post.